Arista Networks SFP-10G-DW Compatible 10GBase-CWDM SFP Transceiver (SMF, 1470nm, 40km, LC, DOM). 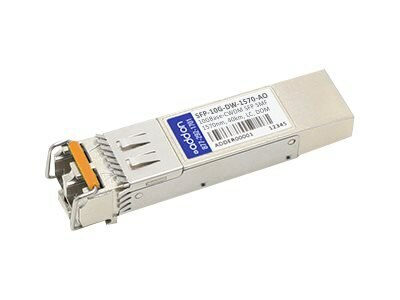 A 100% Arista Networks SFP transceiver that operates at 1470nm over single-mode fiber, with a maximum reach of 40km connected via a LC connector. This Arista Networks compatible SFP transceiver has been programmed, uniquely serialized, and data-traffic and application tested to ensure it is 100% compliant and functional. The SFP transceiver will initialize and perform identically to Arista Networks' transceiver and is built to meet or exceed Arista Networks' specifications, and comply with MSA (Multi-Source Agreement) standards. The actual part shipped may have a different part number, but will be functionally identical and 100% compatible. Trade Agreements Act (TAA) versions of this part are available.